Osmo Coding continues in that innovative vein and provides a simple way for kids to understand command structures. When you think of coding for kids, your mind probably envisions them learning some elaborate coding language in an experience akin to your French verbal exam when you were at school. But coding for kids comes in all shapes and sizes and doesn't have to be scary. That's the main approach of Osmo Coding, a new game for the Osmo iPad accessory that bridges the gap between the physical and virtual world. Using the Osmo kit, which is effectively a stand and a mirror so the iPad can see in front of it, Osmo Coding encourages players to piece together a series of instructions to move Awbie, the friendly lead character of the game, to eat as many strawberries as he can. The app is as playful as it is educational, but the success comes with the simple-to-use and beautifully crafted game pieces. There are tiles for walking and jumping, amongst others, which each have moveable directional arrows to allow Awbie to progress in the right direction. It's not just a case of placing a move tile to move forward, though. The game slowly ups the ante by encouraging you to do a number of movements in series, and an array of 1 – 6 numbered tiles that magnetically snap together help things progress even further. Before you know it you can be racing ahead with a five sequence play to clear an obstacle and collect as many strawberries as possible. This gives kids the basic tools to understand computer programming through move sequences - something that should stand them in good stead to progress to more complicated coding tools as they get older. Understanding that could get boring fairly quickly - children are fickle aren't they? - but the game goes one step further by encouraging you to improve your base camp (Awbie's home), and therefore earn seeds to grow plants to then harvest to improve your situation. Grow enough and you can upgrade your camp, and testing that out on the Pocket-lint children, this proved to be just the carrot to bring them back for more. Of course all this can be done through a number of different educational coding apps. A quick check on the App Store shows there is no shortage there, but Osmo coding takes it from being just "another app" to something far more interactive - and that's a really positive thing. Osmo is an excellent system and we're already big fans. Rather than simply provide an educational application, the physical nature of the games and their accessories means children get a more tangible way to learn and parents can interact and help more easily. Osmo Coding continues in that innovative vein and provides a simple way for kids to understand command structures. Even if just seen as a logic puzzle game, it works really well. Regardless of the kids' involvement in our house, we've found ourselves playing it into the early morning. 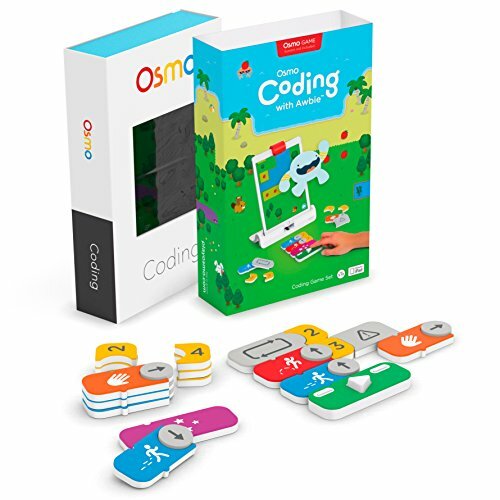 Priced £49, you'll also need the original Osmo Starter Kit (£75, which includes Tangram and Words packs) in order to play this Coding add-on. It's not cheap, but it's worth it for how well it merges education and play in a modern way.